There is an interesting story of Bhagavan Sri Krishna capturing a demon and imprisoning him in his Dhoti. The story, which is laced with symbolism, also involves Balarama, the elder brother of Bhagavan Krishna. Once, Krishna and Balarama was traveling through a forest. When it became night, it was impossible for them to travel. Therefore, they decided to take rest in the forest. Balarama was worried that if they slept they will be attacked by animals or demons. So, Sri Krishna came up with a plan. Balarama will stay awake when Sri Krishna slept and Krishna will keep vigil afterwards when Balarama slept. Soon Sri Krishna went into deep sleep and Balarama stood guard. Soon a demon like creature appeared in the distance and made a war cry. Balarama got sacred and took a step back. An interesting development happened during this incident. When Balarama got a scared and took a step back, his size was reduced. Now he was of the size of Sri Krishna. The size of the demon increased. The demon moved a step forward and made a fierce cry. Balarama got scared and took a step back and now his size was again reduced. The size of the demon increased again. Each time the demon made a cry, Balarama moved a step back frightened and he was reduced in size. Each time when this happened, the size of the demon increased. Soon Balarama was of the size of a small mouse. He could no longer suffer the fear, and called out the name of Sri Krishna. Bhagavan suddenly woke up and thought Balarama had gone off to sleep; and therefore had woke him up by calling his name. Bhagavan started to guard the place. The demon gave a huge war cry. Sri Krishna was amused and asked the demon to keep quiet as his brother was sleeping. 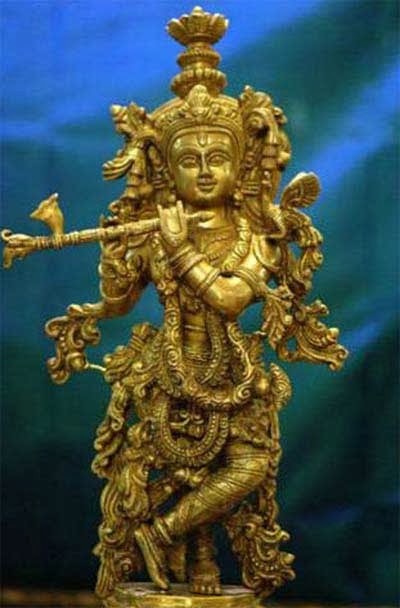 The size of the demon reduced and the size of Krishna increased. The demon now gave another sharp cry to scare Krishna. This time too Krishna asked the demon to keep quiet. The size of the demon got reduced and the size of Krishna increased. The demon continued his attempts to scare Krishna. But Sri Krishna was not scared. However, with each attempt, the size of the demon reduced and the size of Krishna increased. Now the demon became so small like a little rat. Krishna was fed up with the antics of the demon. He lifted him up and tied him inside his dhoti. Soon it was morning, the demon disappeared; Krishna and Balarama got back their true form. It is easy to understand the symbolism of this story. The demon was fear. Fear becomes powerful when we are scared. We become a slave of fear. Face fear boldly. If we cannot face fear and our inner demons, then we will be trampled upon by others. Life will become a hell.